Can you guess the hidden phrase? Link letters into words to reveal parts of the phrase. 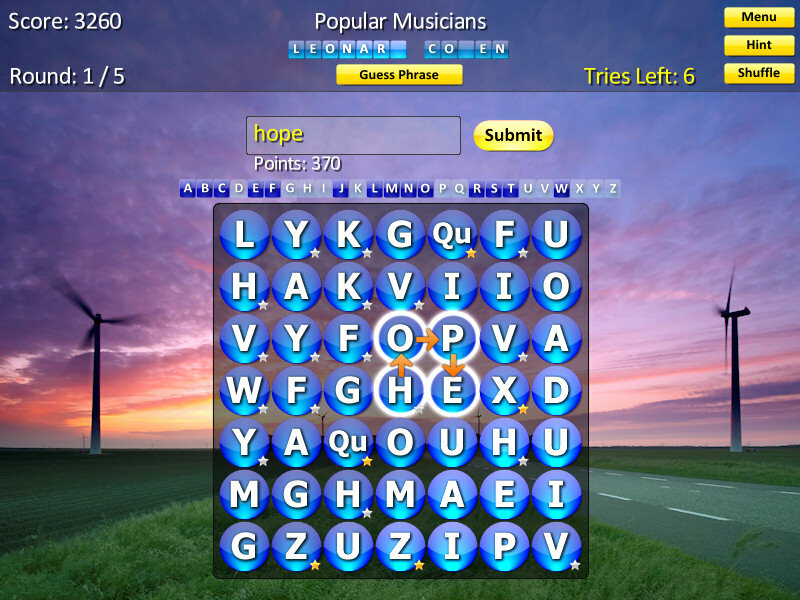 Solve different categories such as Movie Titles, Popular Musicians, World Cities, Animals and many more! When you play Guess The Phrase, your goal is to guess a hidden phrase. To reveal letters in the phrase, you link letters to make words. When you make a word, the first letter of that word is revealed in the phrase. Contains more than 1000 phrases to solve! When you play Guess The Phrase, your goal is to guess a hidden phrase. ...... game is really engaging for both the eyes and the brain!" "Beautiful graphics, challenging and very user friendly! I love that you can actually learn stuff from playing it!" "This game helps my dyslectic daughter. Even I learn stuff from it!" "This is a really fun brain exercise. I play it together with my grandson every time he comes to visit. I also learned a lot from the additional information you get about the composers, thinkers etc. That makes this game more than just a bunch of word puzzles thrown together!" Qweas is providing links to Guess The Phrase 1.24 as a courtesy, and makes no representations regarding Guess The Phrase or any other applications or any information related thereto. Any questions, complaints or claims regarding this application Guess The Phrase 1.24 must be directed to the appropriate software vendor. You may click the publisher link of Guess The Phrase on the top of this page to get more details about the vendor.